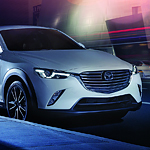 At Tim Short Mazda, We have the new Mazda CX-3 and drivers are excited. This popular subcompact crossover comes with numerous safety features turning heads. One of the ways the new Mazda CX-3 is helping keep drivers safe is by way of the Blind Spot Information system. Sensors mounted on the rear of your vehicle will scan adjacent lanes and be able to detect another vehicle is moving into your blind spot and warn you by flashing a light on your side mirrors so you stay in the lane and avoid getting into an accident. The Cross-Traffic Alert feature in your all-new Mazda CX-3 is helpful for allowing you to see clearly in all directions as you drive in reverse. Once you start backing up, the system is activated and identifies traffic coming from either direction, giving you visual and sound alerts to slow or stop until that vehicle has moved by.